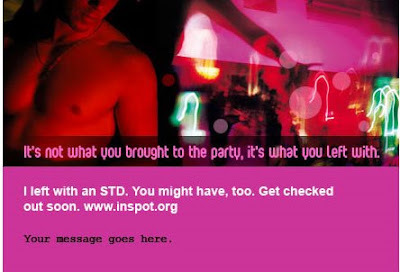 For those of you that aren't too shy to exchange E-mail addresses with the person on the other side of the glory hole but too ashamed to tell them they are leaving with a parting gift, there is now inSPOT, An E-card service that easily allows you to notify your long list of whoretotes and strumpets that they just got Cupid's Itch from your rusty rifle. Thank you internet for making our lives better and better everyday. Stop Email Spam – and Win a Pair of MP3 Players! MyTempEmail.com, the Internet’s premier Spam Fighting, Free Temporary Email Service is sponsoring a video contest where you can win His and Hers’ matching MP3 Players, and a cool logo T-Shirt. MyTempEmail, the web’s most versatile Spam Stopping Disposable Email Address Service is sponsoring a “Use Me Then Lose Me” Throw Away Email Contest. Just create a short video, explaining why you love to use MyTempEmail, and you could win! Go to MyTempEmail.com and click on Video Contest to learn more. Because it allows you to create Random Email Addresses and Custom Email Addresses on the fly! It allows you to create a Custom Email Forwarding Address, for up to four weeks! You can Reply to any email received! It uses RSS to notify you of any mail messages. You can take it with you! Need to click a link to confirm an email when signing up for something online? It’s never a hassle at MyTempEmail. Create a Random or Custom Email Address and just reply to the message right there in the email window. Working a trade show and you don’t want to give out your real email? No worries! Create an Email Forwarding Address, and give out the MyTempEmail address at the show. All email received will be anonymously sent to your real email address, and then you decide who to reply to, and give your personal email address to. MyTempEmail helps to stop the spam by offering you the most choices in creating a Free Temporary Email Address. Once the time limit expires, the email address is no longer valid. So any spam that may be sent to that email goes to an invalid address. The spammers can’t reach you! So make us laugh, make us cry, inspire us! Make you video, and enter today! Go to www.MyTempEmail.com to learn more.